Hoyas, otherwise known as wax plants or porcelain flowers, are seeing a surge in popularity as houseplants—and all for good reason! Many members of the houseplant community are just starting to discover the joy of collecting and growing hoyas, commonly known as “wax plants” or “porcelain flowers”, which are named as such due to the waxy appearance of their flowers (and in some cases, their waxy leaves). Hoya krohniana ‘Eskimo’ in bloom in my home in July 2018. Many folks are attracted to hoyas for their flowers, which are variable across species (and sometimes vary in color within the same species) and often have an array of perfumed scents. In some cases, hoyas are hard to tell apart from one another unless they are in bloom, but to the trained eye, the slight variations in leaf morphology—between species (and even within the same species)—can be detected and very much appreciated. I began collecting hoyas much more in the last few years, and I think part of that own personal evolution stems from wanting to understand and appreciate the genus more. Hoyas have the potential to become an extremely popular and mainstream houseplant largely for a few reasons—one of which I had already mentioned—which are their lovely inflorescences, which remind me of cake decorations expertly crafted out of fondant icing. Many are scented, some are not, and still others are actually quite foul. A good majority of them will smell more at night, which is a testament to who may actually be pollinating them in their native habitats—perhaps some nocturnal moths or beetles, for example. A second reason why hoyas are quite popular as a houseplant is that they are relatively easy to grow from cuttings. Most just need a node or two and a leaf to take root. Some, which have chlorophyll in their stems, may not even need a leaf—but only a node—to take root and eventually grow. (As an aside, I received a finicky Hoya globulosa cutting over the early spring, which quickly decided to lose its leaf after being shipped. However, after two months, the very green stem of this Himalayan native seems to be surprisingly thriving, so I’m keeping it in a humidity tent to see if it’ll regenerate, and it looks promising!) As my friend and consummate hoya collector, Torril Nyhuus, has said, “Some hoyas just require patience more than others.” (We’ll be seeing her collection in an upcoming episode of Plant One On Me soon). Certain hoyas—particularly those that are more fuzzy and delicate—like Hoya linearis—are a little more challenging to root and to keep happy in the longterm—than say ones with thicker, hairless stems and prolific adventitious roots, like the highly cultivated Hoya carnosa or ever-popular Hoya pubicalyx. And all require a decent level of humidity, which we’ll touch upon soon. Finally, once you have a basic understanding of how most hoyas like to be cared for, then you’ll discover that they are relatively non-fussy houseplants—growing vigorously and flowering consistently year over year. Asclepias syriaca or common milkweed, is in the same subfamily as Hoya. Here you can see the umbelliferous inflorescence of the milkweed. Hoyas are part of a family known as Apocynaceae, which include the dogbanes, and are placed in the subfamily Asclepiadoideae, which are the milkweeds. For those familiar with common milkweed (Asclepias syriaca), you’ll know that it has an umbelliferous flowerhead; sticky, latexy sap, and seeds with long silky hairs—much like hoyas. A Hoya seed pod, which you can see how it shares a resemblance to the Asclepias seed pods above. The first hoya was ascribed to the genus in 1810. As of 2015, there have been over 500 scientific names published, however, there is much discrepancy within the group—and new species are being discovered regularly. In speaking with hoya experts, collectors, and botanic gardens around the world, there likely are somewhere between 600-700 hoya species—many still undescribed or unnamed. Hoyas, however, are not the easiest plants to collect, because as I’ll share shortly, many are growing epiphytically (on other plants) in the treetops. Oftentimes, it’s on felled trees where botanists and collectors can actually get access to plants. Figure 1. Hoya is largely distributed throughout subtropical and tropical Asia as well as through the western Pacific. Map: Homestead Brooklyn. The greatest diversity of hoya comes out of subtropical and tropical Asia through the western Pacific. Philippines, Indonesia, Malaysia, and Papua New Guinea particularly have a high diversity of hoya, but they can also be found in places like Thailand, China, Singapore, India, Bangladesh, Cambodia, Japan, Laos, Vietnam, Myanmar, Vanuatu and even Australia, just to name some of the areas (see Figure 1 above). A Hoya kerrii ‘Variegata’ growing epiphytically in the crags of a tree. Most hoya are growing under 1000 meters (3280 feet). Some, however, grow very close to sea level—scrambling along beaches on grasses and bushes—whereas some are growing in higher altitudes. Elevation comes into play when growing hoya indoors because higher altitude species, like Hoya linearis, can be challenging to grow in the home over the long-term, as it often needs slightly cooler temperature at night—and frequent misting, since they can be subjected to heavy monsoon seasons in their native habitats. Those growing close to sea level in lowland beach areas, like Hoya diversifolia, often exhibit greater succulency and often require (or can withstand) more intense light conditions than most cultivated varieties found in our garden centers. Additionally, because they are growing in these low-lying areas close to coral, they likely will require a bit more calcareous substrate or amendments to their potting medium. This is a relatively large cultivar of Hoya carnosa that I’m growing in my home. When getting a hoya, you may want to consider whether it is a climbing/vining plant; a bushy, erect plant, like Hoya multiflora; or a pendant/hanging plant like Hoya bella. I’d often classify hoya into a few different types of growth structures. The first is more vining/climbing (e.g., Hoya australis). The next is more hanging/pendant shape (e.g., Hoya bella). Then there is more erect, bushy and shrublike, which is a bit more uncommon (e.g., Hoya multiflora). And finally there is a shape more in between pendant and shrub-like (e.g., Hoya cumingiana). You may want to consider a hoya’s growth structure for your space. For instance, I have some of the pendant shaped ones in hanging baskets, whereas a larger Hoya pubicalyx is more of a floor plant climbing up on a trellis. Hoya leaves can vary from very thin to semi-succulent to very succulent. With the exception of Hoya imbricata, which is a shingling hoya that only gets one leaf per node, hoyas produce opposite leaves. Leaves always seem to be simple—so never serrated, for instance. This can make them a bit more challenging to tell apart when the plant isn’t in flower, but it also allows the hoya lover to appreciate the nuances of the foliage. You can often deduce the habitat (and therefore the requirements) of your hoya by looking at the leaves. Thinner, darker, larger leaves often means the plant is more accustomed to shadier, wet environments (e.g., Hoya multiflora), whereas thick, succulent, lighter-colored leaves likely mean the Hoya requires fuller sun and can withstand some level of drought (e.g., Hoya diversifolia). Hoyas that seem to have a semi-succulent leaf, like the ever-popular Hoya carnosa, will often require a short dry period in order to flower. In the case of H. carnosa, 4-5 weeks of drying out in the spring, along with good window light will likely encourage the plant to flower more. Some stems of Hoya are woodier, some have chlorophyll, some are fuzzy, some are thick, and still, some others are really delicate. 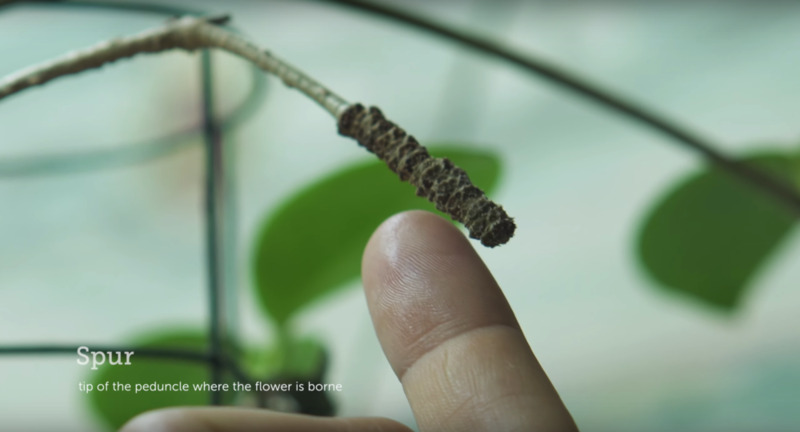 Observing the stems of your Hoya can help you know how to better care (and how best to propagate) the plant. Hoya stems are often wiry and lactiferous—producing a sticky substance that can often be white, clear, yellowish, or some other color. Along some stems, you’ll find adventitious roots, which make some hoya particularly easy to root. If you give these hoyas higher humidity, the adventitious roots will often grow outwards and begin to cling to certain surfaces. Some stems have chlorophyll in them and I find those don’t even need leaves initially to root. It’s common for hoya to send out long tendrils, which often will have small, insignificant leaves. A common question people ask is whether you should cut those off or let them grow, and my answer would be—let them grow. Give the hoya its own time to clasp and tendril around something. Once it’s found a suitable location and suitable sunlight, it will often start growing out its leaves. But just a word of caution: many hoyas like to cling—and I’ve found myself in situations where I’ve tried to move a hoya to dust / water / <insert verb here>..and I’ve pulled down multiple plants at once because the hoya tendrils have seemed to grasp onto anything and everything around them. A close-up of hoya flowers, which allows you to really see their true beauty. I’ve already touched upon hoya flowers, but they do vary. 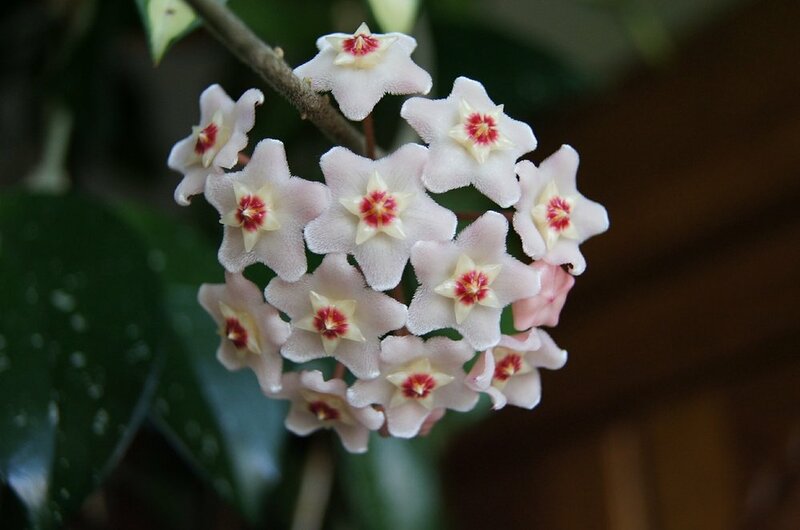 The flowers of hoya, which have three main parts—the calyx, the corona, and corolla, are arranged in umbels, which is a flower cluster that emanates from the center to form some type or curved (convex) or flat-topped surface. The corolla, which are the petals of the flower, also have six types, including spreading, revolute, reflexed, campanulate (bell-shaped), incurved (claw-shaped), or urceolate (urn-shaped). Flower color will vary—and it’s not uncommon for the same plant to have different flower colors as well. This is partially how certain plants, like Hoya pubicalyx has so many different cultivars, or cultivated varieties of plants featuring such a wide range of flower colors. Hoya carnosa has a convex umbel with approximately 20-40 flowers/umbel and a spreading corolla. Hoya bella has a flat-topped umbel with about 6-10 flowers/umbel and a spreading corolla. Hoya multiflora has a reflexed corolla and a convex umbel that contains 25-40 flowers. As I shared above, many hoya have adventitious roots along their stems and these roots are used to both adhere to surfaces as well as absorb moisture. Upping the humidity will likely form more roots and make them larger, which will benefit the hoya. Since most hoya are epiphytic—growing on the surface of trees—they are accustomed to drying out, so they are a bit opportunistic when it comes to getting water, and these adventitious roots can serve as a way to soak water when they have it. However, giving hoya too much water for too long will not serve the plant. In fact, it will likely harm or even kill the plant, so it’s imperative that it is potted in some well-draining potting medium. More semi-succulent varieties of Hoya carnosa were my first hoya that I grew and I made the mistake of putting them too near my southwest-facing window, which caused leaf burn. Most hoya (with exceptions) can’t withstand such direct, intense light. Since most species grow in the gaps of forests—among and between the treetops—they are more accustomed to getting dappled or diffuse light—and that should be recreated in the home. When visiting different botanic gardens and growers of hoya, it is customary that they grow hoya under 50-80% shade cloth to protect from direct sun. I’ve found that more succulent varieties, like Hoya kerriii, Hoya crassicaulis, and Hoya diversifolia can withstand about 90% full sun conditions, but would still prefer a little less sun for fear that the intensity of the ultraviolet rays would break down the chlorophyll in the leaves. In some cases, certain varieties might begin to redden their leaves (e.g., Hoya vitellina), which can be pretty, but you have to be careful not to fully burn the plant and damage the chlorophyll in the process. I have most of my hoyas growing in one of several locations in my home: pulled away 1-4 feet (0.3-1.2 meters) from my southwest-facing windows; in my northeast-facing windows; near my northeast-facing windows and augmented with grow lights; and completely under grow lights. Most hoya don’t mind being a little rootbound, as they are used to growing epiphytically, so I don’t often repot my hoya. Instead, I just refresh their substrate every second or third year or so. Given that I’ve been growing some of my earlier hoya for around four years now, that means I’ve repotted them once, and will be repotting some of them again sometime soon. Because they like to dry out more than most plants, I prefer to use terracotta pots since they are porous and can more readily remove water from the soil substrate or potting medium—but do be sure to thoroughly water them so the entire soil ball becomes wet and is allowed to dry. Hoya, particularly the epiphytic ones, are accustomed to growing in very little substrate, so it’s not uncommon to find hoya mounted on wood and wrapped in Sphagnum for display in one’s home. Because of the lack of substrate in these displays, you’ll likely need to do more frequent watering. I have one of these displays in my bathroom of a Hoya pachyclada and I find I need to spray the roots every few days, and I treat it much in the way I do my Tillandsia, or air plants. Putting the mounted hoya on the same watering schedule as my Tillandsia has helped a lot. Otherwise I find it easier to care for hoya in substrate. In Asia, it is customary to grow hoya in pure coco chips. Generally my potting mix is about ⅓ peat, ⅓ perlite, and ⅓ orchid mix (fir bark, perlite, charcoal). I find this gives a fairly airy mix. This is particularly important because hoya don’t like to be sitting in water. They require intermittent drying out. If they don’t dry out—they’ll rot pretty readily. But if they don’t receive enough water—their roots will often dry out and die back. (More on this in the Troubleshooting section). Some hoya species can be found in more limestone areas, so it would be intuitive for me to think that these hoya would grow well with a bit more alkaline (or “sweeter” soil). Crushing up eggshells or using oyster shells on top (or within the soil mixture) should suffice, as the substrate will slowly get more alkaline as you water the plant. Watering hoya thoroughly isn’t a problem if you have a well-draining soil mix. If your soil mix is too heavy—say a really peaty mixture—then you risk the substrate holding too much water. I really water my hoya based on the quality and intensity of light that I’m giving them. Those closer to my southwest facing window definitely get a higher frequency of watering—and definitely more so in the summer months. Those that are growing near my northeast-facing window or under grow lights will get watered far less. In some cases I withhold water during certain times of year depending on the species. For instance, Hoya carnosa is accustomed to short periods of drought in its native habitat, so withholding water for 4-5 weeks in spring is customary and will help in flowering. Aside for the higher altitude species, which require slightly cooler temperatures in the evening hours—most hoya can’t withstand chilly temperatures. Anything below 50°F (10°C) can result in chill damage—so be wary if you’re ordering hoya over the winter months in the Northern Hemisphere; you’ll either need to purchase the appropriate amount of heat packs—or wait until spring delivery. The long time cultivated Hoya carnosa, however, is a bit more cold hardy—often withstanding icier drafts in the winter in my northeastern window. Hoya are more accustomed to moderate to high humidity, particularly being from subtropical and tropical zones. Additionally, some go through a monsoon season, which means they are accustomed to heavy rains for part of the year. I’ve found that the more succulent hoyas are not necessarily too finicky if given less humidity—but most will thrive if given a bit more. Some of the thinner-leaved varieties I’ve found are nearly impossible to keep happy for any length of time if not given a level of 60-80% humidity, so I’ve positioned those around my humidifier or in some cases, within plastic bags (what I lovingly call “the poor man’s humidifier”). I’ve met some growers who keep their finicky, humid-loving hoyas behind glass (with a humidifier) to maintain a constant level of humidity. Hoya aren’t particularly heavy feeders, however they appreciate some extra micronutrients and macronutrients. I generally fertilize mine on a biweekly to monthly basis and with either a light, gentle, organic fertilizer or a balanced synthetic fertilizer cut by half. When I see that one is about to flower, I will often use a “bloom booster”, which is a bit higher in phosphorus. Whether this truly helps them to flower or not, I cannot say. I’ve also met growers who use slow-release fertilizer, so that is an option as well. Hoya can grow large and unwieldy, so if you need to prune your hoya, then that is fine. Any dead, brown stems can be cut back. And if you have vigorous stems, you can either let them grow, wind them around a trellis, or just trim them back to a node. Note that when you are cutting the stems, the latex will often spew out. I do know some people who actually put glue on these “cuts” to prevent the latex from spilling out, but I don’t personally do that myself. However, be sure not to cut the peduncle, which is the stem of the inflorescence. This is where the flower will emerge year over year. Some species will naturally lose their peduncle, but it’s more common that hoya maintain their peduncle. At the base of the flowers is the “spur” and the “peduncle”. This is where the inflorescence emerges year after year. Be sure not to cut those off or else you won’t get any new flowers! Be sure not to remove the spurs or the peduncles of your Hoya. Even though these are “woody”, they will produce more inflorescences year over year. As I shared in the beginning of the post, part of what make hoya so enjoyable as houseplants is that they are relatively easy to propagate. Most are amenable to just having one or two-node cuttings stuck in water, Sphagnum, or even a sterile potting medium. Thin, fuzzier varieties often are challenging to root. And if you have a woody stem, then they may also be more challenging to root—or may not root at all. Keeping up the humidity is often imperative to better rooting, so enclosing the plant in a plastic bag or humidity dome will help immensely. I demonstrate hoya propagation in Ep. 112 “Hoya Care and Propagation” video below. Hoyas are fairly resistant to pests, but mealybugs can be found on leaves; and aphids can be commonly found near flowers, particularly hoyas that produce a lot of nectar, like Hoya kerrii, for instance. You can use sharp sprays of water to first get the buggers down; and then I would recommend a horticultural oil or neem spray, like the items above. Hoya leaves are burning / turning red — this may be a sign of too much sun, so move plant back from the sunlight or place in another area of the home. Hoya leaves are shriveling — hoya may not be getting enough water and/or humidity, there may be die-back or an issue with the roots (perhaps they are dead or have dried up), or may be a sign of mealybugs. Check the plant and assess what the situation may be. Hoya is starting to look limp — roots may have died back completely due to overwatering or lack of watering. Check the roots and if that’s the case, then take a healthy cutting to propagate the plant. Hoya hasn’t flowered — this can likely mean that the hoya has not had enough light, however, certain hoyas may require some type of “stress” to encourage blooms (i.e., cold period, dry period). This is usually determined by the type of hoya and what ecosystem/habitat it is from. Buds fall off before bloom — this can mean that the potting medium was too dry for too long—or too wet for too long. Leaves fall off abruptly — often means that the hoya got a cold draft or chill. Ensure the hoya is in a warm, humid location. Hoya has sticky sap on the leaves — if the hoya is not in flower, then check if there are any sap-sucking insects, like aphids or mealybugs. This sticky substance may be an indication that there are pests on the plant and should be taken care of accordingly (see Pest section above). Some hoyas, like H. kerrii, H. multiflora, and H. imperalis, for example, can produce copious amounts of nectar. This can stain your furniture, cloth, and will coat leaves. Clean this off leaves, as it can invite aphids and sooty mold, for example. One thing to note: If you let your hoya dry out too long, try not to overload it with water on your next watering. Just give it a little water at a greater frequency. Watch the Plant One On Me hoya video below for more tips!